By James Lara on Mar 22, 2014 - 28 Comments. You thought death was the worst possible fate? Think again. Like previous installments, Dark Souls 2 focuses on a centralized world that has little to no narration. It’s shrouded in a mist of shadow, leaving players to freely explore its world. There is no one to hold your hands, no markers to tell you where to go, and no right path to choose. Around every corner lurks danger and there is no such thing as a safe place. You are basically told right from the start that you are screwed in this forsaken world, and it’s for that reason (and others) is why I love this series. Dark Souls 2 continues to build upon Dark Souls 1’s world, though this time, you’ll be exploring the far coastal kingdom of Drangleic instead of Lordran. You begin your journey into darkness as a cursed character, like all previous installments. You don’t know what has happened, or why the Kingdom of Drangleic has fallen and with every passing moment, your body slowly begins to give in to the Hollowing, fearfully trying to resist becoming undead. There are a lot titles out there today that enjoy giving you the straight facts about the game’s story, but the Souls series has never been about that. It’s all so beautifully lacking in narration (never thought I would say that), leaving players to discover and piece together the story themselves through exploration, victory, and death. Despite already putting in over 100 hours of playtime, there is still so much to be discovered, though having a few friends along doesn’t hurt. 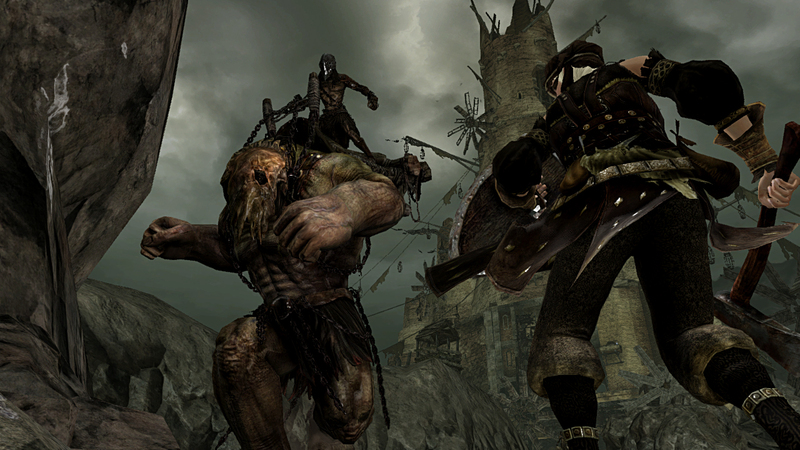 The single player campaign can be explored and beaten online. But if you are connected, it’s not really a “single player” game anymore, but rather a combined entity of single player and multiplayer experiences. Blood stains are left by other players who have perished to the unknown, giving you helpful insight as to how they died and what dangers might await you. Messages placed on the ground are left by other players, sometimes warning you, sometimes deceiving you. In addition, at any given moment, another player can jump into your world through invasions and destroy whatever little progress you may have been attempting to accomplish. 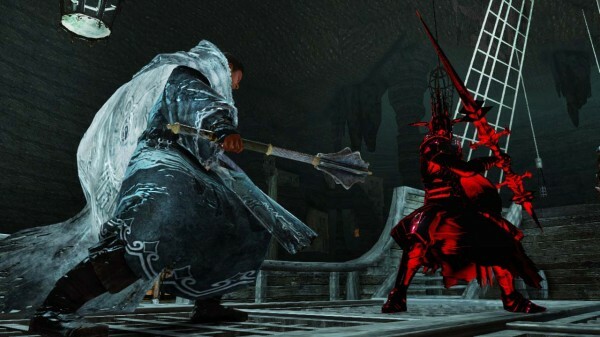 The line between both single player and multiplayer disappears in Dark Souls 2 and the way the two mix is near brilliant. Other players who invade your world don’t feel like other players, but instead appear as if they are rooted into the world itself. You are playing alone, but you really aren’t. Dark Souls 2 operates on a leveling system, though you don’t exactly gain any XP that is put towards your level like in most RPGs. Instead, after defeating any enemies, you are rewarded Soul Points, which can be used for leveling up, buying items, or performing certain in-world actions. Souls Points, in a sense, are like XP points, except you have to manually put it towards your level, if you so choose, which can only be done from the main hub area. You also lose all of your points if you die, and trust me, you will die a lot. When you level up, you don’t gain attributes to all of your stats. Instead, each stat has its own level, which allows you to creatively mold your own build. Two level 50s could be completely different from one another. One could be more focused on higher physical hit points, whereas another could have much higher health, yet weak attacks. The build possibilities are endless when you factor in character class, level build, armor set, and weapons. As mentioned, friends also can play a crucial role in your experience. Dark Souls 2 continues along with the series’ classic three-player co-op, though gaming with friends has become a whole lot easier (a complaint in past titles). However, it wouldn’t be a Souls title if you didn’t have to work for it, meaning you can’t just simply start a fresh game and play co-op from the get go without getting blood on your hands. Getting a summoning stone, required to play co-op, is a journey of its own. In fact, you can very will miss the opportunity to even pick one up, making it difficult to play co-op with friends. It’s things like this though that really pushes a player to explore more and learn all about the back story of the world. 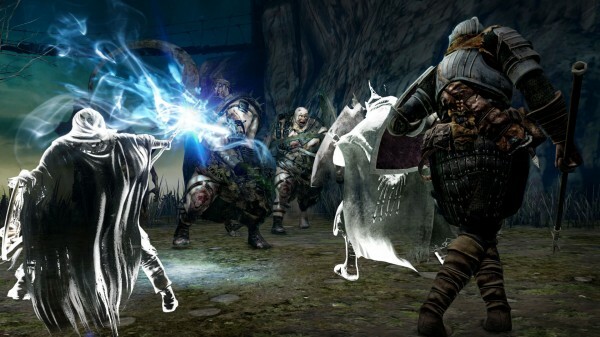 In Dark Souls 2, there are special conditions required to play co-op, or even invade another player. The summoning system works only if you are in a Human state form, which is achievable with certain items. You’ll also need to be within a certain soul range of the host. You can’t join or invade a player’s world if, say, you are soul level 100 and they are 20. This is obviously to set balance, though at this very time, it’s unknown exactly how big the maximum range is. You’ll also need a summoning stone in order to place down a soul sign. If you have joined another player for co-op, you will be in their world or vice-versa. Everything will be structured the same as yours. However, any progress made in another’s does not reflect the progress made in your world. If you help someone to defeat a boss you haven’t defeated yet, then you’ll have to defeat that boss by yourself or by having players summoned into your world. Like I said, no one is holding your hand. But, to make playing with friends easier, as per requested in past Soul games, there is a ring that allows you to select a god. If both players are wearing the ring and select the same god, summoning one another becomes a whole lot easier instead of randomly hoping they see your soul sign. Player vs. player is identical in terms of restrictions, except instead of a summoning stone, you must use an invasion stone. You’ll appear as a red phantom to the player that you are invading (or they’ll appear red if they are invading you). If you get really good at the game, it’s extremely enjoyable. In truth, it’s really abut being a big jerk to the target player, but this game is all about struggles and making things harder. My favorite thing about invading other players is that you can wear a ring that makes you appear as a White Phantom, which is what you appear as when you co-op with someone. It really confuses players thinking that they are apart of a co-op match, but, in reality, you’re just there to be that jerk. The only real con about the multiplayer is the poorly structured Soul Memory system. It isn’t as much of a hassle in the beginning of the game as it is later one once you’ve racked up a ton of souls. It makes it hard to co-op with friends, or even at times with random players. If From Software does update the game with a patch, it’d be nice to see this frustrating system removed. Despite what has been in this review so far, the world of Dark Souls 2 isn’t as gloomy and dark as it’s made out to be. Death is everywhere, yet life still blooms wherever your hero goes. Whereas past installments adopted colors of coldness, Dark Souls 2 opts for shades of deep warmth, creating a vast and beautiful atmoshpere. Although the lighting isn’t as spectacular as was shown during the initial reveal gameplay, it still looks astonishing staring out into the sunlit abyss. There is so much variety in its terrain, it’s easily one of those titles you stop playing for a bit just to stare at your surroundings. Though its atmosphere comes off as almost peaceful, you know better than that. Yes, you will see some poorly detailed textures here and there, but honestly, for how big the game really is, I don’t really blame developer From Software, seeing that the studio is working with consoles that are eight years old. As for performance, at least during my own playthrough, I didn’t really notice any major drops in the frame-rate, despite some screen tearing. Like I said, I’ve already put in 100+ hours into Dark Souls 2 and I honestly believe that I have only scratched the surface. I have played many open world RPGs from Final Fantasy to The Elder Scrolls, but let me tell you this: Those titles have nothing on Dark Souls 2 when it comes to replayability. Its world holds an uncountable number of secrets just awaiting to be found and boasts about 30 to 35 different boss types. Even if you were to defeat them all, New Game + ramps up the already gruelling difficulty level and, from what I understand, introduces new bosses and secrets. 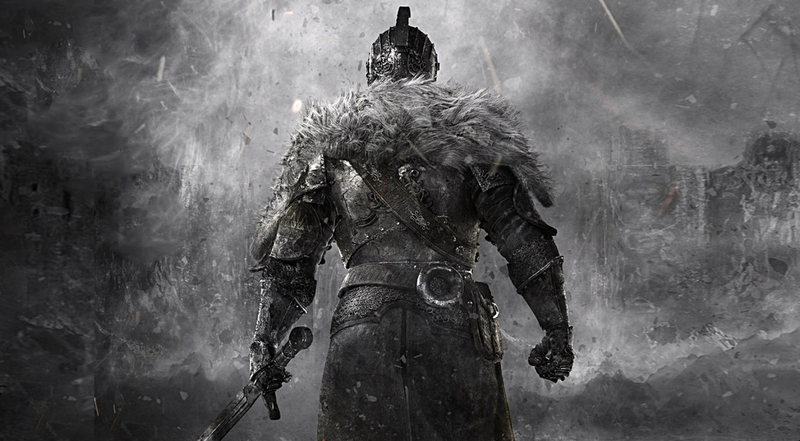 At the tail end of a console generation, Dark Souls 2 is perhaps the biggest bang to go out with. It improves on literally every aspect of previous iterations and goes beyond the expectations set for it. It’s large, it’s colorful, and despite being filled with undead baddies, the game has a life of its own. It is the RPG that we have been waiting for.